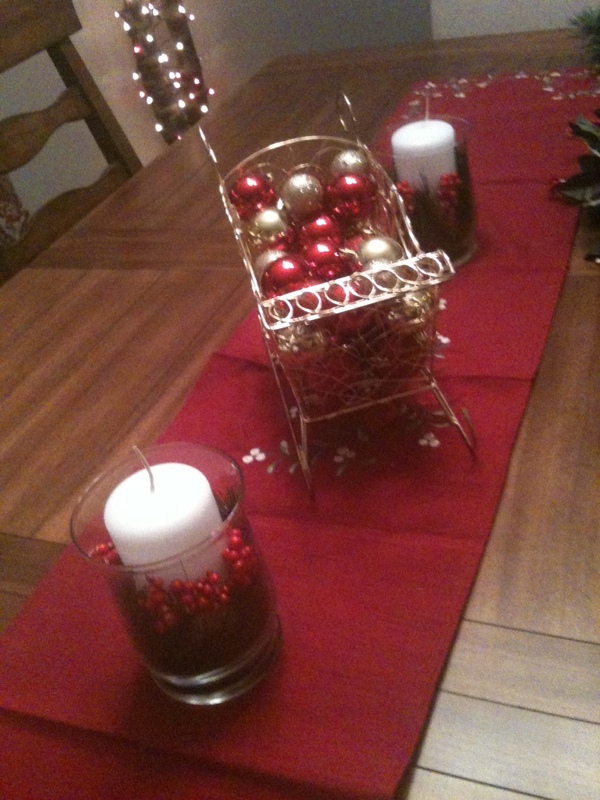 First and foremost, I’d like to point out that although this centerpiece is cheap in price, it is not cheap-looking. I’d put that in the headline, but I hate long headlines (except for this one). We didn’t have a house last year – so we didn’t have that little thing called a mortgage and all the joy that brings. Since we didn’t have a house, and we didn’t know how long it would take to get a house, we stayed with ManFiancé’s parents, rent-free. Our bank accounts were ballin’ … Now, not so much. We celebrated Christmas with ManFiancé’s family, which is somewhat smaller than mine. Meaning: less presents to buy. This year, both families are coming to our house for Christmas. Holy Griswolds! It’s pretty safe to say, money is tight around here (like it is everywhere else), so I’ve had to get creative with my Christmas decorations. Since we never really had a place to call our own, I basically had to start from scratch when it came to decorating the house – especially holiday decorating. 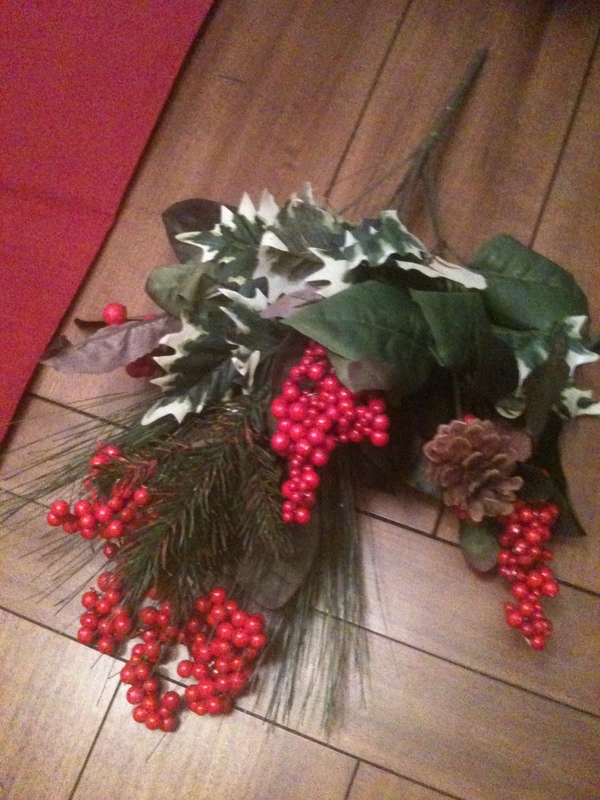 Next, I took the fake flowers and pulled them apart. 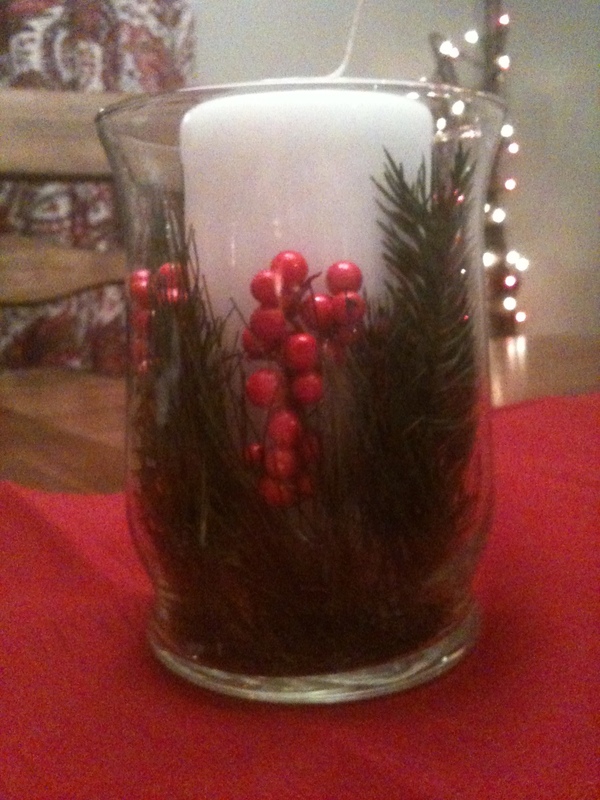 I pulled the fake cranberries off (but left them in bunches), and cut up the fake greenery. 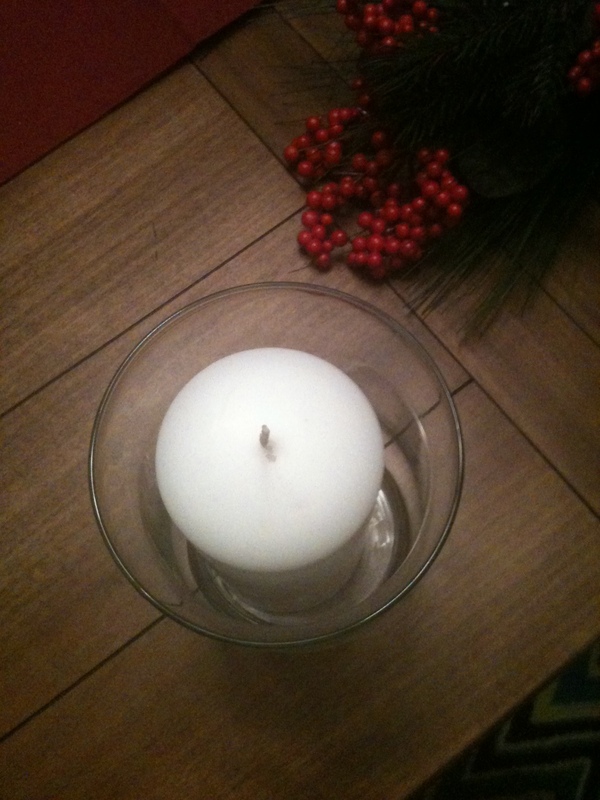 I placed the candles in the vases, and stuffed the fake cranberries and fake greenery into the vases – right up against the candle. Everything in the vase was positioned so that it not only looked attractive, but also kept everything tight and in place. I must say, the best time to shop for any type of holiday decoration is right after the holiday has ended. So I will admit that I did buy a few things last year to save extra money. As you may or may not know, I am officially addicted to the Goodwill near my house. Not only did I score a complete gold China set for $25 there, but that store in particular sells new items at a discounted price. And it’s the nicest, cleanest, awesomest thrift store I have ever been to. Period. 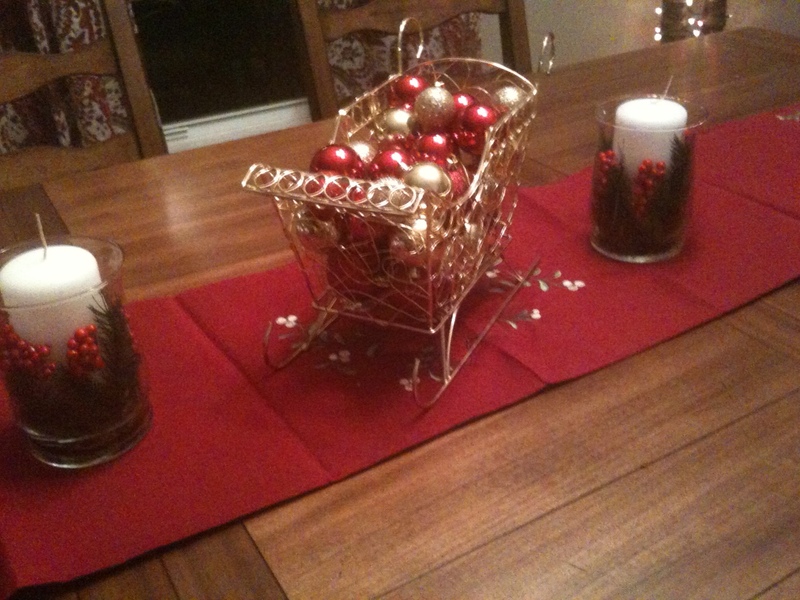 I bought a gold Santa’s Sleigh and cheap ornaments for $5. 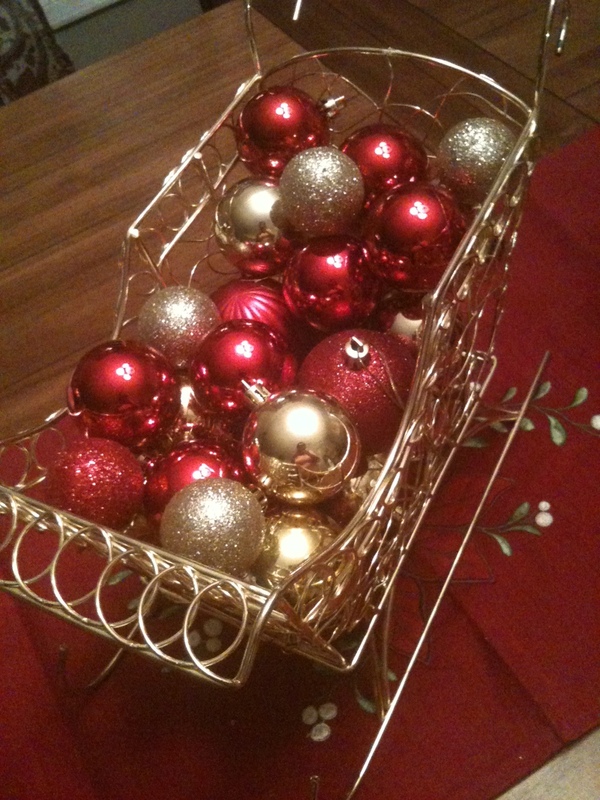 $26 total and I’ve got me a pretty kewl Christmas centerpiece. Martha, eat your heart out. Beautiful! Such a diva of decorating! Loved it..probably will copy your idea! Looks good moose, just don’t light those candles! Looks great, Rachel! You would never know it took less than $30 for you to put it together. I love it Ray, looks awesome!!!! Good job on the price as well!! Love u! !